Sitting close to the center of Germany, historic Frankfurt - the country's fifth largest city - makes an excellent jumping-off point to explore such places as the beautiful Rhine Valley and the Black Forest, each just a couple of hours away by car or rail. Closer to Frankfurt, you'll be rewarded by many wonderful day trip possibilities and exciting things to do, including a cruise up (or down) the River Main, a delight to see via tour boat. There are also numerous old towns and cities to explore, including lovely Hanau and Mainz, along with many well preserved castles, cathedrals, and ancient fortifications dating back as far as Roman times. The historic old town of Hanau, at the junction of the Kinzig with the Main rivers, just 20 kilometers east of Frankfurt's city center, is an easy and enjoyable day trip. In the town's old Marktplatz stands the New Town Hall (Neustädtisches Rathaus), built in 1733 and notable for its charming carillon and monument to Jacob and Wilhelm Grimm, the famous Brothers Grimm, who were born here. It's a connection celebrated each year with the popular Brothers Grimm Festival. Another town highlight is the Goldsmiths' House (Goldschmiedehaus), home to an exhibition of jewelry and a reproduction of a traditional goldsmith's workshop. Also of note, and just four kilometers northwest of Hanau's old town center, is Schloss Philippsruhe, a fine Baroque palace that now houses the Hanau Historical Museum, with its collections of ceramics, silver, and paintings, as well as numerous artifacts relating to the Brothers Grimm, plus a fine sculpture garden. Just 44 kilometers west of Frankfurt on the west bank of the mighty Rhine River, the magnificent old cathedral city of Mainz is home to a number of first-rate attractions that together add up to a perfect day trip. The city's rich history has been well documented and preserved, thanks to its many fine museums, most notably the Museum of Ancient Navigation (check out its full-scale replicas of Roman vessels) and the Roman-Germanic Central Museum. Also worth visiting is the Gutenberg Museum celebrating the life of Johannes Gutenberg; the creator of the world's first movable type printing technique was born here in 1398. 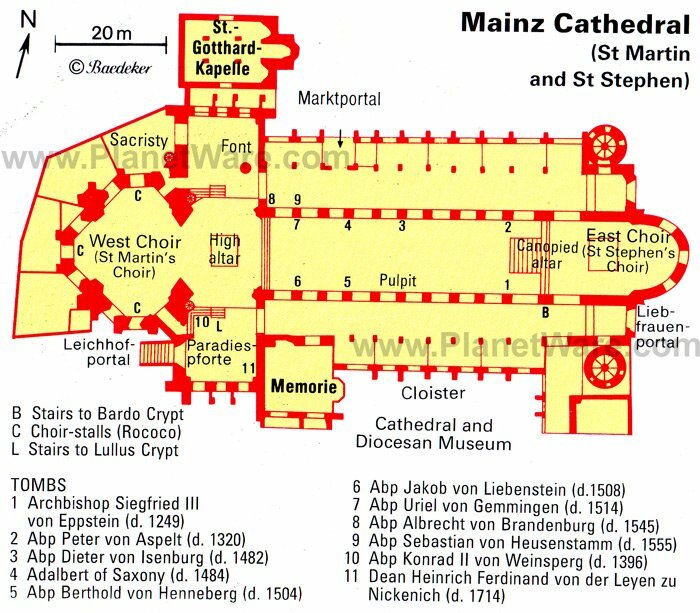 The main attraction, though, is the magnificent Mainzer Dom or Mainz Cathedral. Although construction of this lovely, six-towered edifice started in AD 975, much of the present structure dates from the 11th century, when many of its tombs were added. Be sure to also visit the Cathedral Museum, with its many displays relating to the building's long history. Stretching all the way from Switzerland to the Netherlands - a distance of 1,320 kilometers - the Rhine is one of the most impressive sights in Germany. Nowhere is this truer than in the Rhine Valley, a popular tourist area extending from Koblenz in the north all the way south to Mannheim. Fortunately for those traveling in and around Frankfurt, this magnificent UNESCO World Heritage Site is easily accessible from the city, either by car, public transit, or riverboat (a variety of cruise options are available, from day trips taking in one or two key settlements and castles to longer overnight stays that allow greater opportunities to explore). Towns of interest include the city of Worms, one of the country's oldest, famous for its 11th-century cathedral. Mannheim is perhaps the easiest city to access from Frankfurt and is perfect for those wanting to catch just a glimpse of the Rhine. The best way to explore is on foot, starting at the historic Marktplatz with its Old Town Hall (Altes Rathaus) before heading over to Planken and the Kurpfalzstrasse for some shopping. A lovely 90-minute drive south from Frankfurt along the Rhine is the beautiful spa town of Baden-Baden. Pedestrian friendly and fun to explore on foot, Baden-Baden has been popular among spa goers since Roman times, thanks to its famous therapeutic waters. In fact, it seems everywhere you turn there's somewhere to sample the town's thermal springs, including many reasonably-priced public baths (for a little luxury and pampering, head to the elegant Friedrichsbad, with its Roman-style setting). Suitably refreshed, continue your walking tour in the Kurgarten, with its many fine boutique shops, art galleries, and cafés, as well as the impressive chateau-style 19th-century Kurhaus. Baden-Baden is the gateway to the Black Forest, a beautiful, hilly, and forested area dotted with postcard-perfect towns of half-timbered medieval houses. Esslingen, not far from Baden-Württemberg's capital of Stuttgart, has the largest intact collection of original medieval half-timbered buildings in Germany. Baiersbronn has an impressive collection of its own, but it's better known as the fine dining capital of Germany, with seven Michelin stars between its three restaurants. Stop in Triberg to climb alongside Germany's highest waterfall or to tour the Black Forest on the Black Forest Railway. The Black Forest is the home of cuckoo clocks and Black Forest cherry cake. You can sample this beautiful region on an 11-hour Black Forest and Baden-Baden Day Trip from Frankfurt, traveling by comfortable coach along the scenic Rhine for a guided walking tour of Baden-Baden and a scenic drive through Black Forest villages to the popular lake of Mummelsee. Opposite the Black Forest on the French side of the Rhine River, Strasbourg is an elegant and cosmopolitan city, capital city of the Alsace region and headquarters of the European Parliament. Its Gothic cathedral is one of the finest in Europe, surrounded by an old quarter of narrow streets and half-timbered buildings. Known as La Petite France, Strasbourg's historical town center is a listed UNESCO World Heritage Site. Narrow, flower-draped canals wind through the city, and a boat ride through these is a delightful way to tour. Strasbourg is also known for its outstanding cuisine. You can combine a guided tour of Strasbourg with a drive through Germany's beautiful Black Forest region on the 10-hour Black Forest and Strasbourg Day Trip from Frankfurt, which also includes a walking tour of Baden-Baden. A pleasant two-hour drive southeast of Frankfurt brings you to one of the most visited and photographed historic towns in all of Germany: Rothenburg ob der Tauber. Perched high atop the steep banks of the River Tauber, this well-preserved medieval town was once the capital of Bavaria and boasts numerous architecturally important buildings, some of them, such as the impressive old Town Hall (Rathaus), dating as far back as the 13th century. A highlight of any visit is to walk along the town's old walls and battlements, untouched since 1618, when they withstood assault during the Thirty Years War. Other structures of note include the 15th-century Council Tavern (Ratstrinkstube), the Imperial City Museum, and the early 17th-century St.-Georgs-Brunnen fountain. And just when you thought this town couldn't get any prettier, head over to Little Square (Plönlein). Like something out of a fairytale, this tiny square consists of a tall, narrow half-timbered building separating two streets, one leading up to Siebers Tower, the other down to Kobolzeller Tower, both of them built in the early 13th century. English language guided tours are available from the town's visitor center. You can combine Rothenburg with another of Germany's most popular attractions on a Neuschwanstein Castle and Rothenburg Day Trip from Frankfurt. This 14-hour trip includes round-trip transportation from Frankfurt accompanied by an expert guide and skip-the-line entry to popular Neuschwanstein. An easy one-hour drive south of Frankfurt, the splendid old city of Heidelberg makes a perfect day trip. One of Europe's most romantic cities due to its attractive riverside location and unspoiled medieval and Renaissance architecture (Heidelberg was spared the bombing that destroyed many other cities in World War II), Heidelberg is also popular for its warm and pleasant climate, making dining al fresco a distinct possibility almost year-round. It's easy to traverse on foot, thanks to its many pedestrianized downtown streets. A good place to begin your walking tour is the Hauptstrasse, Heidelberg's narrow main street. From here, numerous even narrower streets lead you to some of the best examples of the city's architecture, many of the buildings now serving as shops, galleries, and cafés. Stop to see one of the best examples of the city's fine churches, the 15th-century Church of the Holy Ghost (Heiliggeistkirche) and take the funicular or climb to Heidelberg Castle. Built in the 16th century, nearly 200 meters above the old town, it's one of the most picturesque castle ruins in Germany and offers great views over the surrounding countryside. You won't miss any of the city's highlights if you opt for a Heidelberg Half-Day Trip from Frankfurt, led by a guide who is well-versed in local history and architecture. You'll walk through the old town, visit the university and tour the castle before the short ride back to Frankfurt. Some 50 kilometers northeast of Frankfurt, on the southern fringe of the Vogelsberg, is the quaint little town of Büdingen. This fun day trip includes pleasant strolls along stretches of the old town's 15th-century walls and their round towers, as well as through the Marktplatz. Here, you'll find the Late Gothic Old Town Hall, with its museum exhibits outlining the history and folk traditions of the region, its many old half-timbered buildings, and the 15th-century St. Mary's Church (Marienkirche). Also of interest is the nearby village of Grossendorf, home to the Remigius-Kirche, one of the oldest churches in Germany, and the formidable Schloss Büdingen, a 13th-century fortress boasting many handsome state apartments, a museum, and a Gothic chapel. Just 35 kilometers from Frankfurt, Darmstadt lies at the end of the Upper Rhine plain amid the foothills of the Odenwald and is the former capital of the Grand Duchy of Hesse. A top attraction here is the Mathildenhöhe, where Grand Duke Ernst Ludwig established an artists' colony in 1899. Here, you can admire the many Art Nouveau houses, browse art exhibitions, or climb the 48-meter-high Hochzeitsturm (Wedding Tower) for views over the town and its many pleasant gardens. Adjoining are the gilded towers of the Russian Chapel and, a short distance away, the Ernst-Ludwig-Haus, home to the German Academy of Language and Literature as well as the Art Nouveau Museum. Other Darmstadt highlights include the excellent Schlossmuseum with its fine collections of portraits, period furniture, and handicrafts. For more Darmstadt history, visit the Hessian Landesmuseum, with its artifacts, art galleries, and natural history exhibits. 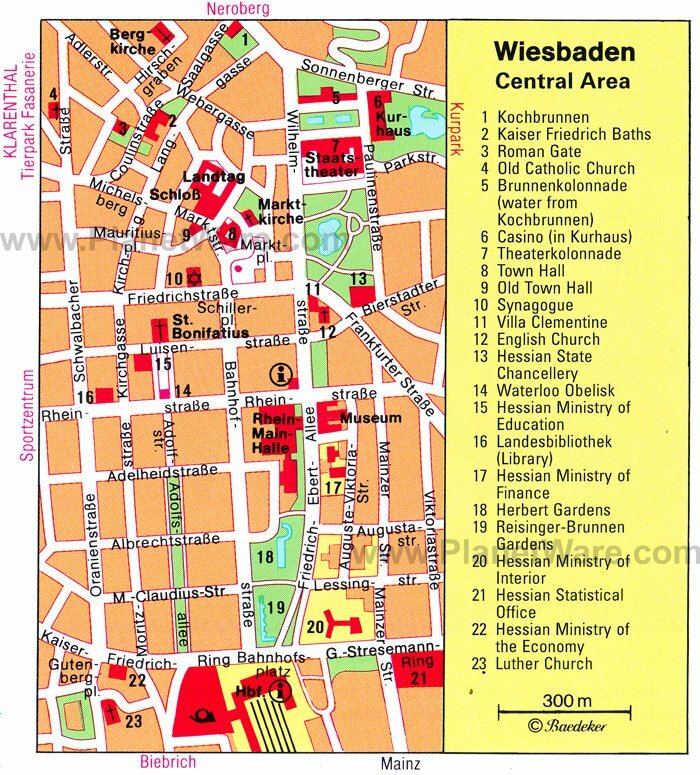 Wiesbaden is another historic city that lies within easy reach of Frankfurt. Just 35 minutes' drive due west of Frankfurt, the capital of the Land of Hesse is famous the world over for its excellent thermal springs, a big draw, particularly among Germans, for their curative nature and many health benefits. 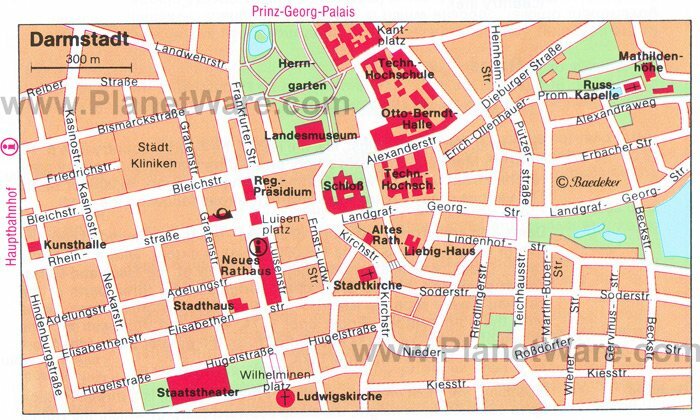 A good place to begin exploring this historic city is the wide Marktplatz, from which you can venture off in search of the many easy-to-find examples from the city's long history as a spa. Perhaps the best known is the beautiful Fountain Colonnade in Kurbezirk, near the imposing Kurhaus, built in 1907 and famous for its massive portico. Next up is the Aukammtal spa district. Here, you'll find a number thermal baths and saunas, most open to the public, and all worthy of a visit for their relaxing qualities. Also notable is the Kochbrunnen, with its 15 hot springs, and the Kaiser Friedrich Baths dating from 1913. Be sure to also climb up the 245-meter-tall Neroberg hill, notable for its Opel Baths (and when you're done with all that pampering, head over to the nearby Biebrich Schloss, a superb Baroque palace built in 1698). Koblenz, just 90-minutes' drive northwest of Frankfurt, offers much for the day tripper to enjoy. Perhaps its greatest claim to fame is the fact that it lies at the junction of the Rhine and Moselle rivers, a point nicknamed the German Corner, or Deutsches Eck, where you can stand and watch these two mighty rivers converge (also of note here is the 37-meter-tall Monument to Emperor Wilhelm I). The city, in fact, straddles both banks of these two rivers, and a great way to see the area is via a fun river cruise. Other highlights include the massive Ehrenbreitstein fortress dominating the right bank of the Rhine and accessible by cable car. Be prepared to spend at least a couple of hours exploring the fort's battlements, as well as its museums. Of particular interest here is the State Museum of Koblenz, home to many interesting displays and historic collections, and a fun unique Baroque-style dining package as well as music and theatrical productions.